Pebble Mill was asked to produce a series of 8 episodes of the garden design programme, ‘Home Front in the Garden’, presented by enigmatic designer Diarmuid Gavin. They went out weekly from October 2002. 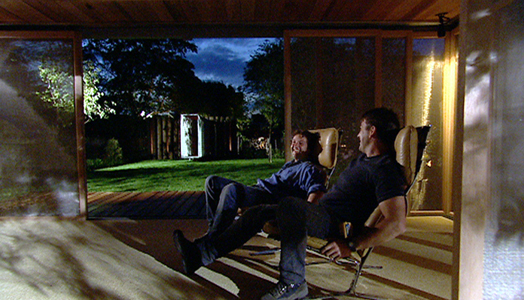 The still shows Diarmuid relaxing in the company of project manager Sean Cunningham. The series was producer by Patrick Flavelle, with David Symonds directing the first transmitted show, a garden in Chingford. It was a challenging series to work on, with Diarmuid sometimes not turning up on location when he was supposed to, and getting fed up with most members of the production team at one time or another. By the end of the series almost no one who was working on the show originally was still there!